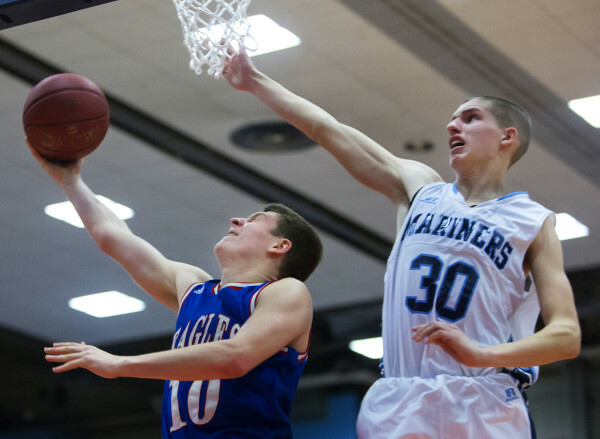 George Stevens Academy's Taylor Schildroth (right) drives up for two past Fort Fairfield's Jared Harvey during their Class C boys basketball championship game at the Cross Insurance Center in Bangor on March 25. Schildroth was named the BDN's William Warner tourney MVP in Class C.
Machias' James Mersereau (center) takes a shot during the Bulldogs' Feb. 26 Class D North basketball final at the Cross Insurance Center in Bangor. Mersereau was chosen the BDN's William Warner tournament MVP in Class D.
Messalonskee's Nathan Violette (left) shoots around Oceanside's Amos Anderson during their Class A North boys basketball championship game at the Augusta Civic Center in Augusta on Feb. 24. Violette was named the BDN's tourney MVP in Class A.
Taylor Schildroth was somewhat of an aberration during a North region boys basketball tournament with few offensive slugfests. The junior guard from George Stevens Academy of Blue Hill, who scored 61 points during a regular-season game this winter, remained a prolific scorer while leading the defending state champion Eagles to their second straight Class C regional title and was named a William C. Warner Most Valuable Player Award recipient for the second straight year. 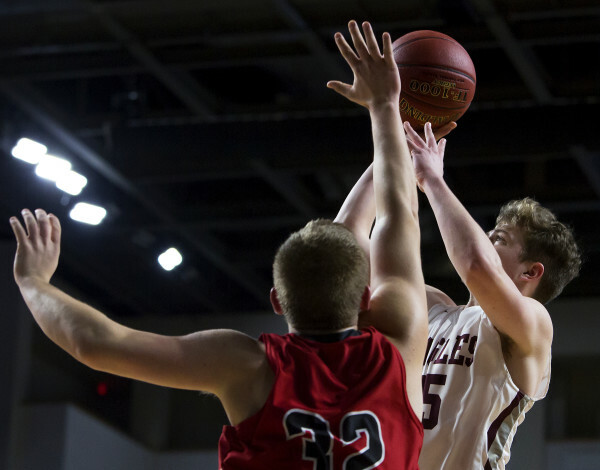 Schildroth averaged 22.3 points during GSA’s three tournament victories and battled a fever of 101 degrees in the hours before the undefeated Eagles outlasted Fort Fairfield in the regional final. Riley Swanson, one of nine seniors who guided Mount Desert Island to its first regional crown since 1995, was named MVP of the “B” North tournament, while senior forward James Mersereau earned top honors in Class D after similarly leading Machias to its first North/East title in 22 years. Senior guard Nathan Violette of Messalonskee High in Oakland earned the Warner Award for the Class A North tourney held at the Augusta Civic Center. The BDN did not select a Class AA North squad, but junior guard Terion Moss of defending state champion Portland was honored by Augusta tourney officials as that tournament’s outstanding player-sportsman. Joining Swanson on the Class B all-tourney team were teammate Graham Good, a senior forward, senior guard Nate Desisto of Orono, freshman forward Isaac Varney of Hermon and senior forward Ethan Mailman of Central of Corinth. Others on the Class C all-tourney team with Schildroth were GSA junior center Max Mattson, senior guard Chris Giberson and junior guard Isaac Cyr of Fort Fairfield and senior guard Justin Thompson of Schenck of East Millinocket. Junior guard Jordan Grant of Machias joined Mersereau on the Class D all-tourney roster along with senior center Nolan Altvater and senior guard Jackson Mathers of Southern Aroostook Community School in Dyer Brook and senior forward Jacob Flewelling of Easton. Class A all-tournament choices along with Violette were Messalonskee teammate James Kouletsis, a senior guard, junior forward Michael Norton Jr. and sophomore forward Cooper Wirkala of Oceanside of Rockland-Thomaston, and junior guard Jordan Roddy of Cony of Augusta. The teams are chosen in voting among tournament personnel, media members and Maine Principals’ Association representatives. In Class B, Swanson, also an all-tourney choice in 2015, led the second-ranked Trojans with 17 points against Central in the semifinals and with 12 points in the final against Orono while also contributing to an MDI defense that yielded just 35.6 points per tournament game. Good was an interior complement on offense to Swanson’s more perimeter-oriented play, scoring in double figures during both the quarterfinals (team-high 13 points) and the semifinals (10). Desisto, also a 2015 all-tourney choice, averaged 13.3 points in three games for the fourth-ranked Red Riots, highlighted by a 23-point outing in the quarterfinals against Presque Isle. The 6-foot-5-inch Mailman averaged 16 points while helping third-seeded Central reach the semifinals. He scored a game-high 19 points in a quarterfinal victory over No. 6 Winslow. Varney made an impressive tournament debut with 25 points in the quarters as No. 1 Hermon held off No. 8 Washington Academy. He followed that with 11 points in the Hawks’ semifinal loss to Orono. 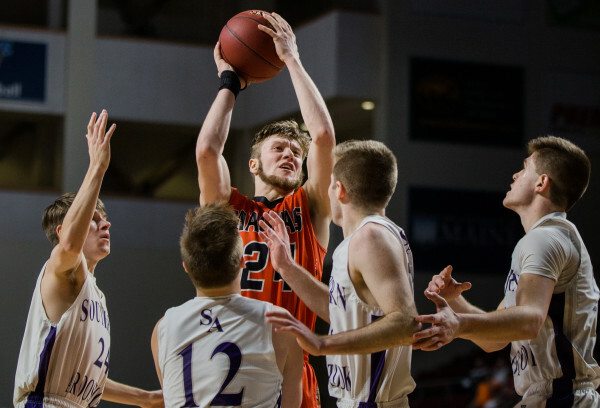 In Class C, Schildroth scored 29 points against Dexter in the semifinals before shaking off his illness to score a game-high 26 in the championship game. The 6-6 Mattson flirted with a triple-double in two of his team’s three games while averaging 14.6 points. He had 15 points, 12 rebounds and nine blocked shots in the quarters, then amassed eight points, 15 rebounds and 12 blocks to help GSA fight off Fort Fairfield. Cyr averaged 15 points and epitomized the fearless play of coach Logan McLaughlin’s No. 2 Fort Fairfield club. He had team-high totals of 19 points in the quarterfinals and 14 points in the final. Giberson, a Warner Award winner in 2014, provided stability to the Tigers’ tourney run this year. He joined Cyr as a double-figure scorer in each of the team’s three games and averaged 13 points. Thompson, who joins Schildroth as a returning member of the Class C all-tourney squad, averaged 27.5 points during Schenck’s stay in Bangor. The versatile veteran scored a tourney-best 32 points to go with nine rebounds during a semifinal loss to Fort Fairfield. In Class D, the 6-4 Mersereau was Machias’ most consistent offensive presence during the regional, averaging 14 points per game. His eight points in the semifinals all came during the third quarter as coach Jim Getchell’s club outscored Easton 31-9 to pull away. Mersereau tallied a game-high 20 points against Southern Aroostook in the championship game. Grant scored 15 of his game-high 19 points during the third quarter of the semifinals to help Machias pull away from Easton after leading just 24-20 at intermission. Altvater and Mathers led Southern Aroostook to the regional final for the third time in four years. Altvater, an all-tourney choice in 2014, scored a team-high 18 points in this year’s regional final and averaged 19 points for the top-ranked Warriors. Mathers, an all-tourney choice in 2016, scored 28 points in the Warriors’ quarterfinal victory and averaged 16.3 points per game. Flewelling, selected for the second straight year, starred for the 2016 regional champions in their return to Bangor. He scored a team-best 18 points in each of Easton’s two tourney games. In Class A, Violette was part of a dynamic Messalonskee backcourt that led the Eagles to their first regional title. He averaged 19.7 points during postseason play and scored eight of his 25 points in overtime of the semifinals as coach Peter McLaughlin’s club outlasted No. 8 Skowhegan. In the championship game, Violette scored 14 of his game-high 21 points in the third quarter to help Messalonskee defeat 2016 champion Oceanside. Kouletsis was Violette’s co-pilot for the Eagles, averaging 11 points — including a basket with three seconds left to send the semifinal with Skowhegan to overtime. Kouletsis grabbed 11 rebounds in the final. Norton Jr. stepped into a prime-time position for coach Matt Breen’s Mariners this winter, scoring 27 points in the quarterfinals and 24 in the semifinals en route to 17.7 points per contest. Wirkala displayed his versatility for No. 3 Oceanside, showing himself as an able ball handler as well as a rising scorer and rebounder. Wirkala averaged 11 points with a team-high 16 points in the final. Roddy was Cony’s top one-on-one offensive threat. He averaged 20 points in the tourney, including 24 in the Rams’ narrow semifinal loss to Oceanside.